Wow, this is cool! 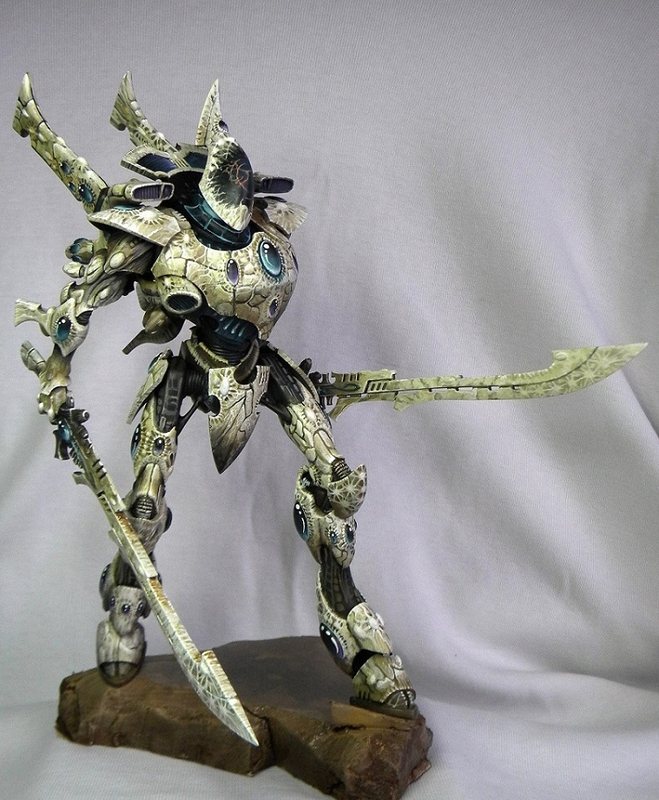 Anyone who has seen the Dawn of War 3 trailer will recognize the inspiration for this mini. 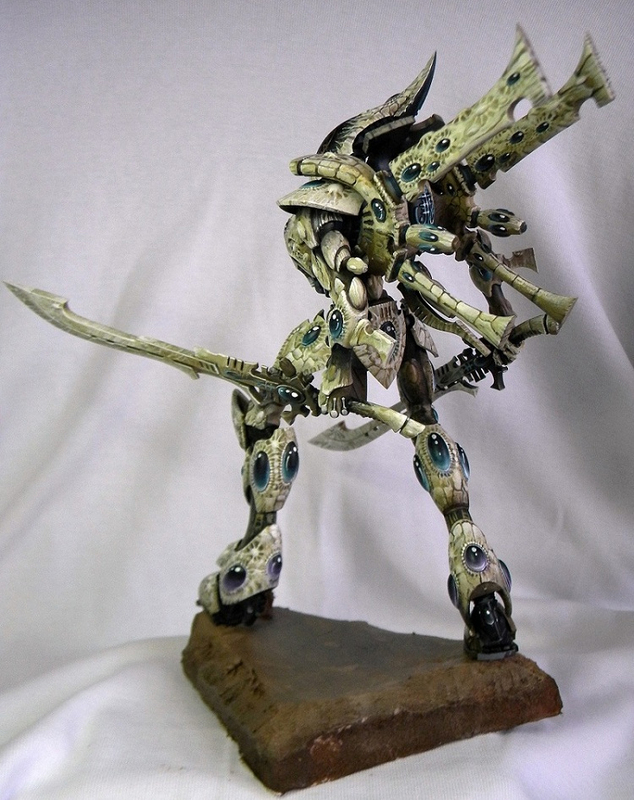 The carapace has a very organic feel to it which is perfect for wraithbone. It definitely borrows heavily from Alien as well, which is perfectly okay. I love the off white with the stark black, it's almost a reverse of the Ulthwé color scheme and is very striking. The amount of freehand on this guy is almost unbelievable. All of those surfaces are actually perfectly smooth and they painted all of that texture onto it. When you consider how tall this model is that must have taken a very long time. I also really like how they painted the gemstones on this. First off, the color choice of purple and turquoise is great, but beyond that, the technique is just top level. The blend is super smooth and they look like they have real depth to them. I don't know if this is the finished base for it or not. I believe this may be part of a diorama that they are slowly working on involving Imperial Knights and more Wraithknights, but I'm not sure. 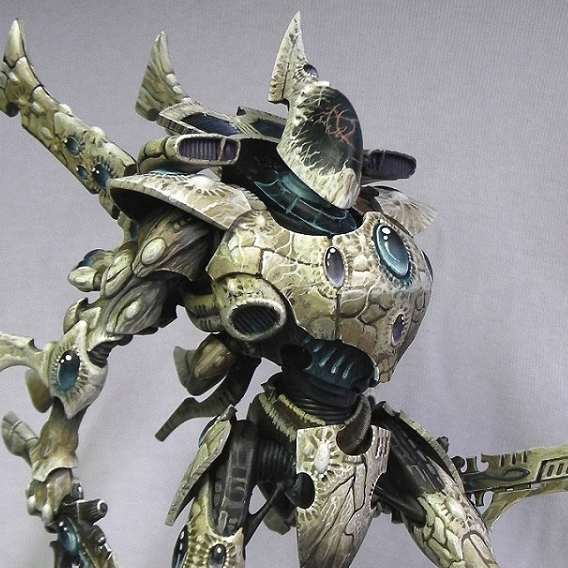 Either way, this model is outstanding and very alien looking.